Lately I have been challenging some of my clients to do stuff that they wouldn’t normally do. I’ve also thrown some personal challenges at myself that I was avoiding doing. Today I want to talk about the power of stepping out, what it does for you psychologically, and some easy ways you can try it for yourself. Humans are creatures of habit, we all know that. Our brains are actually wired for safety and habit because it makes us more efficient. Your brain is constantly seeking patterns, and then once recognized, reinforces those patterns. It strengthens these neural pathways. This works really well when you have a routine you want to stick to, but is terrible if you are trying to accelerate your growth. Your natural tendency is to find the path of least resistance. The cool thing is that getting out of your comfort zone does not have to be a massive undertaking. There is countless research to show how this all just simply relates to anxiety. Pushing yourself to try something new just raises your anxiety levels and that’s good! Anxiety actually brings out the best in us when used in the right way, according to the Wall Street Journal. 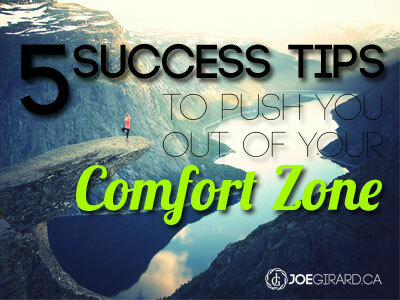 Why should you push yourself out of the comfort zone? Your only goal in life should be to GROW your comfort zone. Not just try stuff. It’s that simple. Never stop finding ways to feel a little nervous. At first, you may have many things that make you anxious (remember high school?). As you learn how to accomplish things that were challenges, you build confidence and expand that comfort zone. When you were learning how to drive, how did you feel? How does driving make you feel now? In his TED Talk about Measuring Comfort Zones, Marcus Taylor actually explains the data on how people who push themselves actually earn higher incomes. Marcus Taylor also created an awesome website tool for you to measure your own comfort zone and see how you compare. Very cool! For me, this has been a consistent guiding principle my whole life and not easy, but well worth it! I love the feeling of being nervous and taking on projects that make me uncomfortable. And by doing that over many years, has made it so that there really is not much that makes me nervous anymore. Try any one of these five things TODAY and see how it helps you make a shift in your thinking. Let’s get some anxiety happening! A few weeks ago, I realized I was putting off launching my first webinar. So I followed my own advice and just simply announced I would do it the following week. When I pushed publish on that blog post, it was a relief and scary at the same time. See, I had purchased the software a year ago and had “wanted” to do a webinar, but for some reason never did it. By saying I would, it just forced me to get it done. The trick is to not care about the results. What’s the worst that could happen? The only thing that matters is just getting something new done. So if you have been putting off a project, want to do a workshop, write a book, or try a new sport, just go for it. Post it on Facebook or call a friend and announce your plan. The webinar went really well – check the replay out here. I have been making my clients do this quite a bit this year. We talk at length about presentation skills, sales messages, your “why,” and many other conversation tools. Then I spring it on them that I want them to shoot a video on their smart phone and send it to me. They have one day. That’s it. They hate when I tell them that. And, like clockwork, all of them ask to have a few days or even a week. No deal. And, pretty much all of the time, the video is terrible. When I started doing video for my site, I had to throw away about 90% of what I shot. Now it’s down to about 50%. It’s hard, it’s unnatural, and it makes us uncomfortable. Even with writing this blog and doing audio, it takes time and practice to get it to become easier. But every time they finish the video and share it with me, they are relieved and actually thank me for making them do it. It seemed like a massive mountain and now it’s done. Just like ripping a band-aid off. So for you, grab your smart phone and practice your story. Tell the camera why it is exciting working with you, what you are looking for in a client, or a tip that your customers would find valuable. Then send it to someone. Do it today. But recently, I downloaded a new app, called Headspace after a suggestion by a friend and it is awesome! It is a guided meditation app and has really helped me sleep easier, slow down my thinking, and be more present. It’s 10 minutes a day. The first sessions were for ten day, so I figured I owed that to myself to try it out. What would you like to add to your life? Reading, journaling, running, or eating healthy? Pick something to do for 7 days, 30 days, or even 90 days and go do it! In fact, if you want a plan, download my 90 Day Sprint Guide. I talk a bit about comfort zone in there as well. I love to network and make new contacts. But when I first started, it was brutal. Networking makes many people nervous. But in reality, all it is is expanding your reach and finding new people you want to build long term relationships with. There should be no pressure to do business with them, no need to impress them, and no expectations of having to be their best friend. It’s just simply to see who’s out there! You never know who you will meet and where your paths will intersect. But if you don’t meet people, you don’t expand your reach, plain and simple. So be someone interesting to talk to and go talk to others. Check out your local meetups or networking groups. You can also network online by joining Facebook groups with shared interests, or on Linked In groups. participate in discussions, help people solve problems, and just be cool. You will be surprised at the kinds of relationships you can build pretty quickly there. I have had countless new people I have met this year through my blog, on Linked In, Facebook, Twitter, and face-to-face that I ended up doing business with. And some really cool new projects and friendships have emerged. Hey, why not? I remember about four years ago, I started this site for free on WordPress while I was still working for my employer. I wanted to share ideas and just help people solve problems. If you have value to add to the community in some way, do it. If you already have a website for your business, you can do this too! It is an amazing way to generate leads, answer questions, and showcase your ability to solve their challenges. All you have to do is identify common questions people have and provide answers. Make videos, write posts, or interview experts. Do some research and share what you find. The key is that you should make it fun, have personality, and enjoy the process. Don’t do it because you feel you “have” to. Rather, get pumped up about getting a solid message out. Be interesting. Well, I hope that gets you thinking about taking action. If you don’t push your comfort zone this week, or even in the next few days, who does that hurt? Only you. PS And I will stand by MY word. I have decided to write three new ebooks. I want the first one out for next week. If I don’t do that, I will take suggestions on a fair punishment. The winner will get three of my own personal favorite business and personal development books. Deal? Remember to like and share this post. And leave comments below – what have you tried recently that made you nervous but was totally worth it?